Most politicians and urbanites in New York are familiar with the dramatic rise of the wine industry in upstate New York, especially in the Finger Lakes region, over the last 25 years. Indeed, nary a week passes without a press release on the growth of the booming wine industry. Likewise, politicians and urbanites are familiar with the increase in organic agriculture over the last 10 years, the dramatic increase in Greek yoghurt production and consumption in New York over the last 5 years, and the potential growth of hops and barley production in support of the developing micro-brewery industry in New York in the next 5 years. What most, if not all of these individuals are unaware of, is that soybean is the agricultural commodity in New York that has increased the most in both acreage and value over the last 25 years. 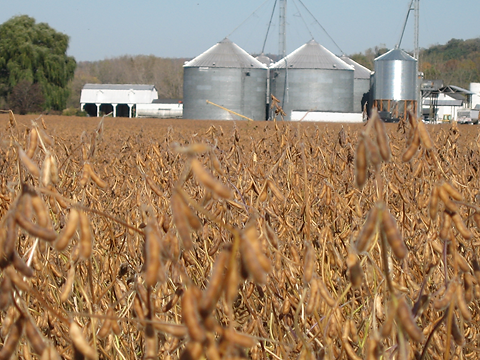 The $195M value of soybean in 2012 ranked the crop as the 6th leading agricultural commodity in New York. Based on acreage and value, soybean is no longer a minor crop but clearly a major NY agricultural commodity. Fig. 1. Soybean acreage in New York from 1988 through 2012. Soybean acreage in New York approximated 40,000 in the late 1980s and increased to ~300,000 acres in 2012 (Fig.1). This 7.5 fold increase in acreage is only exceeded by its 20-fold increase in value since the late 1980s. The annual soybean value approximated $5M in the late 1980s, soaring to almost $200M in 2012 (Fig.2). Fig. 2. Soybean value in New York from 1988-2012. Preliminary estimates indicate that soybean value in New York approximated $170M in 2013 (probably will be revised upward because USDA-NASS estimated the market price of the 2013 NY soybean crop at $12.50, much lower than the price that some NY growers have sold their old 2013 crop at over the last two months). To place the value of soybean in perspective, Fig. 3 compares the value of soybean with the value of all fresh market and all fruits produced in New York since 1988. Fig. 3. Value of fresh market vegetables, all fruit, and soybean in New York from 1988-2013 (excluding the unreported 2013 fruit crop). Soybean value averaged less than 4% of the entire fresh market vegetable industry in the late 1980s and early 1990s. Incredibly, the average value of the NY soybean crop approximated 40% of the entire fresh market vegetable value in 2012 and 2013! Obviously, soybean is no longer a minor crop but a major New York agricultural commodity. March planting intentions indicate that New York growers will plant 330,000 acres in 2014. If planting intentions are realized, New York growers will plant record acreage in 2013. 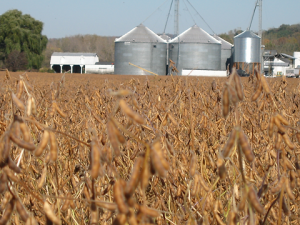 New York soybeans averaged 48 bushels/acre in 2013, tied for the highest State average yield on record. Clearly, the crop is thriving in New York. It is time for politicians, administrators at agricultural colleges, and urbanites to recognize and welcome the fact that soybean is a major New York agricultural commodity.